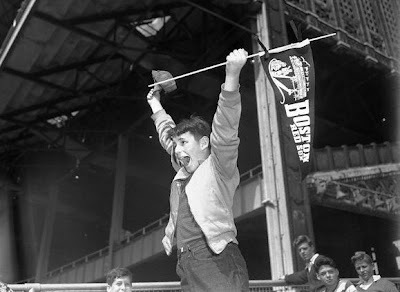 Stanley Silverman of the Bronx now cheers for Boston Red Sox at Yankee Stadium, September 24, 1950, having decided to switch allegiance from the Yankees two years ago because the Sox, with their losing streak, needed more fan support. A most discerning youngster. Is he the same Stanley Silverman who went on to be a famous composer?